György Ligeti’s Le Grand Macabre (1974–77, revised 1996) has consolidated its position as one of the major operatic works of the twentieth century. Few operas composed since the 1970s have received such numerous productions, bringing the eclectic score to a global audience. Famously dubbed by Ligeti as an ‘anti-anti-opera’, the piece is a highly ambiguous, apocalyptic fable about the human condition, fear of death and the final judgement. 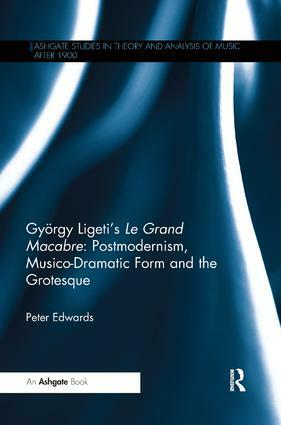 As the first book in English solely dedicated to discussion of this work, György Ligeti’s Le Grand Macabre: Postmodernism, Musico-Dramatic Form and the Grotesque offers new perspectives on the opera’s musico-dramatic identity in the context of musical postmodernism. Peter Edwards draws on a range of modernist and postmodernist theories to explore the collision of past styles and genre models in the opera, its expressive states and its engagement with the grotesque. This is ably supported by musical analysis and extensive study of Ligeti’s sketch materials held at the Paul Sacher Foundation in Basel. Edwards’s analyses culminate in a new approach to examining the opera’s rich multiplicities, the composition of the musical material and the nature of Ligeti’s relationship with the musical past. This is a key reference work in the fields of musical modernism and postmodernism, opera studies and the music of Ligeti. Peter Edwards is a post-doctoral research fellow in musicology at the University of Oslo. He leads a research project entitled ‘Style and Modernity’, funded by the Research Council of Norway. In 2012 Peter successfully defended his PhD thesis on György Ligeti’s Le Grand Macabre; a critical examination of Ligeti’s creative process, the sketches for the opera, and the significance of the opera in the wider context of modern and postmodern aesthetics. He has also worked as a guitarist and composer and has received numerous commissions from leading ensembles and performers. Peter is a member of the editorial board of the Norwegian Journal of Musicology. The Ashgate Studies in Theory and Analysis of Music After 1900 series celebrates and interrogates the diversity of music composed since 1900, and embraces innovative and interdisciplinary approaches to this repertoire. A recent resurgence of interest in theoretical and analytical readings of music comes in the wake of, and as a response to, the great successes of musicological approaches informed by cultural studies at the turn of the century. This interest builds upon the considerable insights of cultural studies while also recognizing the importance of critical and speculative approaches to music theory and the knowledge-producing potentials of analytical close readings. Proposals for monographs and essay collections are welcomed on music in the classical tradition created after 1900 to the present through the lens of theory and analysis. The series particularly encourages interdisciplinary studies that combine theory and/or analysis with such topical areas as gender and sexuality, post-colonial and migration studies, voice and text, philosophy, technology, politics, and sound studies, to name a few.